“Let’s go back to Japan.” – An old, Vaughan proverb. Six years ago, I accompanied my parents on their first visit to Japan. Having already been myself, three times, and having studied Japanese for several years in school, I was put in a unique position of power that was usually reserved for my mother—the linguist of the family. I held the words and the lay of the land—where we went, what we saw, and—most importantly—what we ate was almost entirely at my discretion. I must have done something right, because the holiday was hailed as a great success, and since then, the phrase “let’s go back to Japan,” has floated around the Vaughan household, popping up intermittently. After my mother died two years ago, my Dad finally retired from work and took to a nomadic life. Keeping track of him since has proved difficult, as I’m never entirely sure which continent he’s on, let alone which country. Travel is a balm to an energetic, curious soul. Suddenly, that phrase “let’s go back to Japan” stopped being a mere fancy, and started to involve booking flights and accommodation. And thus, here we are—the Vaughans (two of us, at least) return to Japan at last, and this time for a full three weeks. The trip has been split into four sections: Takayama, Kyoto, Kumamoto and Hakone, with a day in Tokyo on either side. Whilst Dad writes his diary daily, and keeps tracks of his adventures in a small, discrete note-book, I felt I’d chronicle our journey in a slightly flashier way, as we proceed through the chapters of our journey. We left from London Heathrow on the 11th of April, flying BA to Narita airport. It was a twelve hour flight which got us into Japan at around noon on the 12th, (4:00 AM English time). Jet-lagged and a little bleary, we organised our tickets for the shinkansen (bullet train), and made out way via train and taxi to our hotel. Conscious that the best way to beat the jet-lag was not to succumb to the desperate, clawing urge to sleep, we set out into the streets of Tokyo just as night fell, to scavenge some food. The mid-April weather was very pleasant, the evening cool and refreshing. We stopped for ramen—always the easiest go-to!—and then went for a little walk. The hotel offered us an excellent view of Tokyo Tower, which was lit up brightly in red, and stood out vividly across the night sky. As we wondered back I thought I saw snow falling across the road. Confused, I looked again, only to discover it was actually the gentle, meandering descent of several sakura blossoms. Japan’s famous cherry blossoms attract many people in Spring (ourselves included) to the parks and beautiful gardens that are scattered across the country. The following day, we rose early and made our way to Tokyo Station. We took the Shinkansen to Toyama, which was a comfortable journey, about two hours long. At Toyama we changed onto the Hida Wide-view limited-express train, heading toward Takayama station. This journey was an hour and a half and very scenic. The train was quite full, with people standing in the aisles. If anyone is planning on heading to Takayama on this route, particularly during festival time, I would advise reserving your seats, or getting to the platform nice and early! We got into Takayama in the early afternoon. The town was a buzz with activity, tourists coming from every corner of the globe. We counted Americans, Australians, Germans, Philippians, Chinese, French, Canadian, Russian and many more among the people we saw! Dad was particularly impressed with me when I was able to make our a few Japanese tourists as well—people from Kyoto in particular have a distinctive accent! With the town so busy, we weren’t able to book a hotel in it, and thus chose a rather lovely spot in Shinhodaka instead, about an hour’s drive away. This turned out to be an incredibly good decision, for reasons which I will detail later. We hired a car and enjoyed an incredibly scenic and lovely drive up. My Dad, who’s one of those crazy people who sees mountains and goes, “I should climb that,” is well versed in driving through mountainous regions, and thus had no problem getting us there, having had a lot of practise already in the alps and in Switzerland. We were both quite surprised to discover snow as we got higher, and to find several ski resorts and slopes. Trust my father, mountaineering and skiing fanatic, to take me all the way to Japan and still somehow find the ski slopes here. He swore it wasn’t on purpose, but I’m beginning to think he has a special, innate sense for it. We arrived at the Hotakasa Yamano Hotel, which was very picturesque, perched on the side of the mountain, with lovely views, and a well-decorated interior and exterior. The rooms were comfy and warm, and provided free yukata (traditional Japanese clothing) which I was incredibly excited about. Dad and I donned ourselves in these, and went downstairs to enjoy a hot footbath as we planned our next day. We finished the night with a lavish Japanese meal at the hotel restaurant, and then retired early, ready to head out and explore. ‘What am I eating now’ is probably one of the most common games we play in Japan. Traditional Japanese food is usually very artful, extremely tasty, and always a little enigmatic. After breakfast, we headed off immediately for Takayama, to go and join the festival. Takayama has two major festivals, one in Spring and one in Autumn. The spring festival consists of large, ornate floats being paraded through the streets. On-top of these floats are marionettes, which are operated by a dozen strings, and a whole team of people. The floats only appear twice a year, so it’s quite spectacular to catch a glimpse of them. traditional buildings. This was lined with various shops displaying Japanese crafts, as well as food stalls and restaurants. We walked the length of the street down toward the big red Nakabashi bridge, crossing the river toward the Takayama Jinya—the old government house in Takayama. Here we got our first glimpse of the floats, which were out on display. Photo opportunities were made quite difficult by the size of the crowd, so we didn’t linger long, and went to go and see inside the Takayama Jinya instead. This was an enjoyable experience, and well worth the ticket price. The building was large, and—unlike in many places—photography was actually allowed. Each of the rooms had a little signpost in Japanese and English to tell us what the area was used for—this ranged from a meeting hall, to the ‘interrogation’ (read torture) room. I particularly liked the peaceful inner garden, and the tiny little box room, which was especially designed for tea-ceremonies. Having finished the Jinya, Dad and I decided to wonder down the main-street toward where a long line of festival stalls had been set up. Mouth-watering smells saturated the air, and large groups of children gathered around game stalls, trying to win prizes, or catch fish with paper nets! I stopped to buy a pastry filled with anko (red-bean paste), a sweet treat that is a particular favourite, and then horrified Dad by buying some takoyaki, a sort of dumpling with octopus tentacles inside. “Better you than me,” he said, with a grimace as I put one in my mouth. We returned to the floats for 14:30, to see the marionette performances. The crowd was now at a suffocating level, and extended all the way back to the bridge. Some people who were gathered at the front, had been there for an hour already, standing in the full heat of the sun just to ensure they had a good spot. Telephoto lenses on our cameras, and the fact that the marionettes are at the top of the floats, however meant that Dad and I were fine, even from so far back. I confess, as impressive as the marionettes were—some being operated by over 30 strings!—the performance was a little repetitive, and after a while, Dad and I gave up, and slipped out from the crowd. The strange, slightly hypnotic music used to accompany the marionettes, followed us up the road as we headed uphill toward the Shiroyama park. We decided to do the Higashiyama walking course, which takes you up through the hills, and then around back into town on a route that passes by the significant shrines and temples in the area. Having injured my leg in January (I ruptured the ligaments in my knee) the walk was a little tough. That being said, it was well worth it. Walking up into the forested hills was like entering another world—this was the place of the mononoke and yokai—Japanese spirits and demons, that are similar in many ways to the unfriendly faeries and sprites of Celtic mythology. The atmosphere was only increased by the fact we could still hear the rhythmic beating of the drum and the sigh of the music from down in the town. A warning to anyone who does decide to do the walk—the free walking map you get at the festival is useless on this route. If you don’t know the area or have a proper map, you need some initiative and a good sense of direction not to get lost. Fortunately for me, Dad is an explorer extraordinaire, and between my basic ability to recognise a few kanji (Japanese words, based on Chinese letters) and his innate understanding of mountain paths, we managed to find our way out. This was a relief, as at the top of the hill we found a helpful sign that warned hikers that there were bears in the woods. This might have been more useful at the entrance, where we could have turned back, rather than in the middle, at the point of no-return. That would have been an interesting call to my brother back in England. Having managed to emerge from the forest without being mauled, Dad and I stopped off at several of the temples on the route, before giving up the walk—after the climb, my leg was really starting to ache, and the last thing we wanted was for me to cripple myself on the first day of the holiday. We proceeded back into town, and found a pleasant spot for an early dinner—more ramen! It’s advised that people attending the festival stick around in the evening to see the floats being processed through the streets, donned with lanterns. However, with the hour-long drive we faced back to the hotel, coupled with the drag of jet-leg, Dad and I decided to head back early, rather than stick around until 20:00. This was ultimately a good decision, as the darkness came in fast, and both of us were getting incredibly sleepy. Back at the hotel, we donned ourselves in the yukata and both went to the public baths. Japanese baths are great, as are onsen (hot-springs) of which there are an abundance in the mountains. You shower in a separate area and wash yourself down, and then go and soak in a lovely, hot pool. The one at the hotel had separate baths for men and women—inside and out. This is not for people who are body-shy, because swimming costumes and the like are not permitted—you’re naked all the way. However, for anyone who is unsure, I really recommend biting the bullet and giving it a go—it’s a great experience. With the chill of the mountain air, slipping into the hot water of the rock-pool outside and bathing beneath the stars was luxurious. Loose and relaxed from the baths, Dad and I met up again for an evening drink, where we sat together and chatted over a bottle of sake (rice wine), before retiring to our rooms for an early night. On Tuesday the 4th of April, the third year class of the University of Winchester’s Creative Writing programme all gathered together for an evening of celebration, smiles and prizes! I was fortunate enough to be able to attend part of the evening and hear some of the performances given by the students. Short stories, poetry and non-fiction – the variety and quality blew me away and exhibited, once again, the diversity and range of the students at the University. I was able to also see the first batch of prizes that were given out for excellence in different areas of the course, including script writing for mainstream television, and fiction. During a brief break, where were given the chance to refill our drinks, there was also a little quiz given out – with us (the lecturers!) as the subject. Students were asked to identify, from a list, which book we wished we’d written, which book we’d read forever, and what the title of our own books would be! Needless to say, as I meandered about about under the guise of photographer, I was able to take a peek at some of their answers, curious to see who they really think we are. Or just stick around at the University, like I did. Interested in attending? Please add yourself on the event’s page! Mag Mell Publishing is currently looking for authors to contribute to our Diverse Fairy Tale Project! From 2017, Mag Mell Publishing will be putting together our own anthology of our favourite Fairy Tales. The twist—the project is all about diversity. We’re looking for new, fresh versions of these popular stories that will represent minorities – including having POC and/or LGBTQA+ main characters. We are particularly interested in hearing from minority authors who would be interested in contributing a short story between 3,000-8,000 words. Authors will be paid between £10-£20 ($12-$24) per story. This would be a Kickstarter funded project. Authors would not be expected to undertake any work until funding and payment was guaranteed for them. To get involved, or find out more about the project,visit our webpage here! To celebrate the re-release of The Sons of Thestian, I will be holding a colouring competition between October and November 20th. 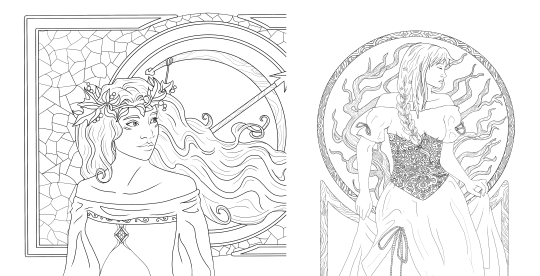 A small series of Harmatia Cycle art (Including above designs by Amelia Mackenzie) will be released, and you will have the opportunity to colour the images. Entries can be done digitally, or printed out and coloured traditionally! What’s more, there are no limit to the number of entries permitted, meaning you can colour all the images if you want, or even do the same one twice! There will be a number of prizes available, and top entries will be featured on my website and on my tumblr. For more details about the prizes, and how to enter, please check back to my website in October, or subscribe to my newsletter and have all the details and download links sent straight to your inbox at the beginning of the month! I have some very important news for you all. Last night, my Publisher The Zharmae Publishing Press announced that they would be closing down. As of the 31st of August, The Sons of Thestian will no longer be available for purchase. The news came suddenly, but fortunately I have a back-up plan, which I will now be implementing. For those of you waiting for Blood of the Delphi, it is still going to be released! I have decided to self-publish my work, and though I may have to push the publishing date (possibly to December), I am going to be fighting tooth and nail to make sure that the book is released this year! What’s more, I will be publishing the 2nd Edition of The Sons of Thestian hopefully at the same time, for any who want a new, matching set. I will be working on making sure the prices for the books are lower, that the quality is higher, and that they are more easily available for anyone who wants to read them. cannot guarantee that there won’t be further delays. These delays are as frustrating for me, as they are for you, and I hope you will all be patient with me. Your readership, your support, is incredibly important to me, and I want you all to know how much I appreciate it and your loyalty. I hope you will continue to support me, and my work. I will post updates as regularly as I can, and the moment I have more information, I will make it available. 1) I will be publishing a short-story with the Random Writers this September. This is a short based on my next project The Kestrel Saga, and I am incredibly excited to share it. More details to follow. 2) I will be releasing images for the Cover-art for Blood of the Delphi, and will be commissioning new matching cover-art for The Sons of Thestian, which will also be released soon. I am, as always, open to any questions or queries, and will remain highly active in the coming months. I will be seeking the advice of other writers who have gone down this path, and will be doing my upmost to get it all right and perfect for you guys. Again, I ask your patience during this time, your continued support and thank you for everything you’ve done so far. I have some exciting plans for the future, and I hope you’ll all be there to see me realise them! In the meantime, if you would like to keep track of what’s happening, please show your support by subscribing to my monthly newsletter here!